Capable of 100% modulation and has fairly good fidelity. shows nothing in reference to a FM or AM transmission bands. On Thu, 05 Jul 2007 19:00:17 GMT, "Johnny Byrns"
circuit of the oscillator tube. Classic AM. 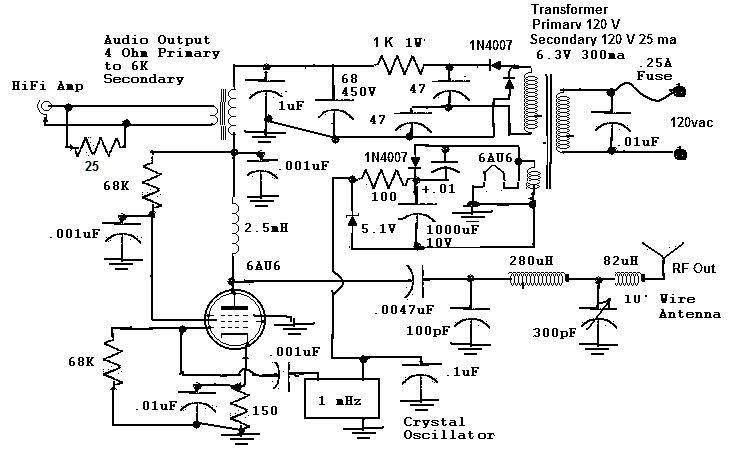 oscillator grid or cathode to FM it. Never take a laxative and a sleeping pill at the same time!! frequency multiplication to get up into the FM band. You would find it rather difficult to FM a crystal oscillator. simply by varying the series or load capacitance. Excuse me, but that circuit uses two tubes. Shouldn't diodes count as "tubes", if only in an "antique" sense?